Up until the last day of 2013, the press inside and outside China was still anticipating an announcement about Zhou Yongkang, which would surely have been the most significant event of the year in China. During Xi Jinping’s visit to the United States in February, 2012, a Washington Times columnist revealed that “Wang Lijun, a deputy mayor in Chongqing, provided explosive details about senior Chinese leaders during an overnight stay and debriefing at the U.S. consulate in Chengdu,” and that “Zhou could arrange the usurpation of Xi and upset the smooth transition from current President Hu Jintao to Xi.” At the time Wang Lijun’s flight had been in the news everywhere, and Chinese netizens immediately used the household name “Kang Shifu”(康师傅), a ramen noodle brand, to refer to the 9th member of the Politburo Standing Committee. What exactly did Wang Lijun tell the US consul-in-general? “Kang Shifu” should know the best, because it was a deputy-minister of the Ministry of State Security under his authority who took Wang Lijun from the Consulate to Beijing. Zhou should have been the first to learn the details of the event and then reported them to Hu Jintao and Jiang Zemin. It was to be revealed later that Wang Lijun had known Zhou Yongkang before he had Gu Kailai and Bo Xilai, and he was indirectly a henchman of the law and security tsar. During the Two Sessions in March, all eyes were on the Chongqing delegation, and Zhou Yongkang made a public appearance with the delegation. Reports said that he was the one who took Bo Xilai safely to Beijing. On March 14, Wen Jiabao first framed the Chongqing incident during a news conference as a struggle about the party’s direction and that “historical tragedies as the Cultural Revolution may happen again.” This spontaneous move by Wen Jiabao forced the CCP central committee to put the Bo-Gu-Wang incident on the table the next day. Three days later on the night of March 18, a black Ferrari crashed on the Baofusi overpass, a major traffic conjucture on the 4th ring road in Beijing, destroying the car and causing deaths and injuries. Photos posted online were deleted; and netizens who reported the heavy presence of cops and armed police in Beijing on March 19 were detained for spreading rumors online. In May, people in the know said that heated argument frequently broke out during the Politburo meetings, because, on May 7, the General Office of the CCP central committee held a direct vote among its members to get an idea of who would likely be chosen for membership in the new Standing Committee. Ling Jihua (令计划), the director of the General Office, was the third of five candidates the Office provided. The Standing Committee, with the exception of Hu Jintao, didn’t know about the vote. It wasn’t until later that people said it was a vote backed by Zhou Yongkang. On June 29, Bloomberg News published Xi Jinping Millionaire Relations Reveal Fortunes of Elite. It had to be the most serious blow to Xi Jinping who, leader-in-waiting, had conducted himself carefully and required discretion from his relatives. Insiders reported the tension was so high that Xi Jinping was going to relinquish his position, and it was defused when his wife Peng Liyuan disclosed their assets in front of the Standing Committee in person. The insiders also revealed that, in July, the Standing Committee meetings were plagued by even more heated argument because overseas media kept exposing the family fortunes of its members and everyone felt vulnerable. As a result of these arguments, the Standing Committee decided to cancel all of the Central Commission for Discipline Inspection (CCDI)’s internal investigations into the members of the Politburo and the Standing Committee. At some point, the Beijing public security chief Fu Zhenghua (傅政华) handed to Wang Qishan (王岐山), former Beijing mayor, Zhou Yongkang’s hand written instruction to the Beijing PSB following the Farrari accident in March. I reported this in an earlier installation of Beijing Observation: “Wang Qishan gave it to Zhu Rongji (朱镕基) who, upon learning the details, cursed, ‘Worse than animals!’ Zhu then reported it to Jiang Zemin, and Jiang Zemin said, ‘How can a man uphold the Party’s principle when he has no humanity?’ Jiang Zemin notified Hu Jintao who, up to that point, hadn’t had the slightest idea about what had been going on, and had to replace Ling Jihua who had kept everything from Hu’s knowledge. The leaders finally learnt the truth about the car crash of Ling’s son Ling Gu after it being tucked away for five months with the help of Zhou Yongkang. On October 25, 2012, the New York Times published an investigative report by its Shanghai Bureau Chief David Barboza that detailed how the Chinese Prime Minister Wen Jiabao’s family amassed a fortune of 2.7 billion US dollars over the past 20 years. When the nine dragons, or known as China’s “nine presidents,” came to attend the 18th Party’s Congress, each was bruised and wounded. Over the party’s congress, Xi Jinping assumed power smoothly, Hu Jintao retired completely, and Zhou Yongkang and the rest of the older Standing Committee members retired. Even Jiang Jiemin (蒋洁敏), Chairman and Party Secretary of PetroChina who assisted Ling Jihua to pay big sums to the two injured Tibetan girls involved in the car crash, made it into the Central Committee. Now that the new era had begun, how many more bloody power struggles would the new emperor have to put up with? The sign came as soon as the Party Congress was over: A case was filed to investigate Li Chuncheng (李春城), the deputy Party secretary of Sichuan province and a newly-elected alternate member of the CCP Central Committee. From the Two Sessions in March to August, Xi Jinping and Wang Qishan had a hard time. The anti-graft plans were aborted, and the new administration found it difficult to assert its authority. Eventually, it changed strategy. In the past, the strategy was “pulling the turnip as well as the dirt around it;” the new strategy was similar to the one used to deal with the “nail-households.” That is, turn it into an isolated island by taking out all the houses around it. Between May and August, with lightning speed, senior leaders in Sichuan and Hubei were taken down one by one, and the domestic media reported the relationship between the son of Zhou Yongkang and money launderers. Then the investigation into the petroleum gang was launched, and the new CCP central committee member Jiang Jiemin (蒋洁敏) was removed. Hardly more indication was needed for the public to see who the true target was. During the Beidaihe enclave (北戴河) in the summer, the overseas Chinese media clamored that a storm was bursting, but those in the know said Zhou Yongkang was also vacationing in Beidaihe. A well-known observer pointed out that, given that Zhou Yongkang started his career in the petroleum industry, was in the posts of the Minister of Land and Resources, the Party Secretary of Sichuan province and the Chairman of Law and Politics of the CCP for ten years, he mostly certainly has secret knowledge about the 9 previous SC members and the current 7 SC members, if not all of the so-called 500 families (or 200 by another version). A breakup with Zhou Yongkang, who has all the secrets in his hands, would completely turn the tables. For Xi Jinping to dismantle the entwined network of Zhou Yongkang, he must have the same resolve with which the Gang of Four was apprehended and with which Mao Zedong eliminated Lin Biao. The day when Xi succeeded in taking down Zhou would be the day he had truly taken control of the Party and consolidated his power. Why Did Jiang Zemin Rush to Beijing? From November 9 to 12, the Third Plenum was held that reviewed and adopted The Decision on Major Issues Concerning Comprehensively Deepening Reforms. It is Xi Jinping’s governance platform for the next ten years, also the first important party literature under his rein. Attendees of the Plenum reported that, instead of the entire body of the Standing Committee, led by the General Secretary, walking up to the presidium, greeted by a standing ovation, this time around, Xi Jinping strode onto the stage first and alone and sat in the middle of the presidium to receive the standing ovation before the other six, led by Li Keqiang, streamed onto the stage and seated themselves on either side of Xi Jinping. On December 1, Li Zhanshu (栗战书), representing the CCP Central Committee, made an announcement to Zhou Yongkang: that he would cooperate with the investigation into related cases and issues, and he would continue to be addressed as comrade inside the party. The decision was circulated to provincial/ministerial level officials on December 5. During the CCP central committee’s economic work meeting in Beijing from December 10-13, the decision was circulated once again. It means that Zhou Yongkang is restricted in his movement. Former minister of petroleum Tang Ke, not in any way associated with Zhou Yongkang, died on the 5th at the age of 96, his obituary still has not been issued even though the body already has been cremated, because Zhou Yongkang’s name was not allowed to appear in the obituary, nor could Zhou send a flower wreath, lest his fall be made known to the public. On December 20, the CCDI website announced that Li Dongsheng (李东生), vice minister and deputy party secretary of public security, and deputy director of the CCP’s leading group on the prevention and handling of cults known as Office 610, was placed under investigation for alleged serious violations of disciplines. People with inside knowledge revealed that Office 610 has been found to have sent materials to Bloomberg News about every standing committee member except for Hu Jintao and Zhou Yongkang. But Bloomberg News only published the story about Xi Jinping’s family because Xi was the leader-in-waiting. Jiang Zemin, who usually spends the winter in the south, rushed back to Beijing on the 23rd, and on the 24th, the CCP central committee announced that Zhou Yongkang was placed under Shuanggui (party discipline for “under investigation in a designated place and for a designated period”). Observers have different takes as why Jiang Zemin sped to Beijing: 1) He turned around to agree with the decision of taking down Zhou; and 2) He continues to mediate between the two sides. Indeed, Zhou Yongkang is a much bigger tiger than Bo Xilai, and he’s a threat to everyone and every family of the top crust. It’s said that materials in his possession are stored both domestically and overseas, and his fortune from graft is up to RMB 100 billion. It is also said that the case of General Gu Junshan (谷俊山), long pending without a resolution, also involves as much as RMB 100 billion in graft. Until Zhou Yongkang’s adherents are purged, the tiger will still have teeth. In 2014, the CCP will undergo another round of power balancing. Zhou Yongkang can be locked up behind bars, or, following the Cheng Weigao (程维高) model, placed in confinement with an announcement of the Party’s disciplinary decision but without a judiciary trial. It’s possible either way. 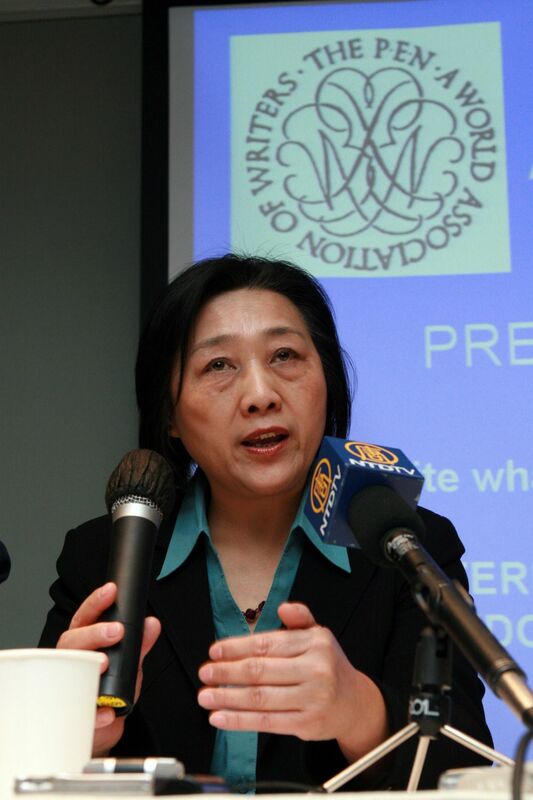 Gao Yu (高瑜) is a Beijing-based independent Chinese journalist and columnist. She used to work for China News (中新社), and later was the deputy editor-in-chief of the Economics Weekly (《经济学周报》). She was twice imprisoned for her participation in the Tian’anmen democratic movement in 1989. Her work has wide influence. By China Change in Analyses and Opinions, Political Transition on January 4, 2014 . Officialdom fiction. Tremendous reading. Best for 2014. Happy New Year, your majesty. It is a work of art the way the author of this unscrambled the confusion of Chinese politics and the complex make up of the Communist Party. Even the powers who maybe upset about a story like this would read it and take it apart for the value to improve their ability to lead. It is an article for good. One just has to view it in a positive way. thank you. this report makes me wonder whether bloomberg news and the new york times should give back some journalism awards they have won.